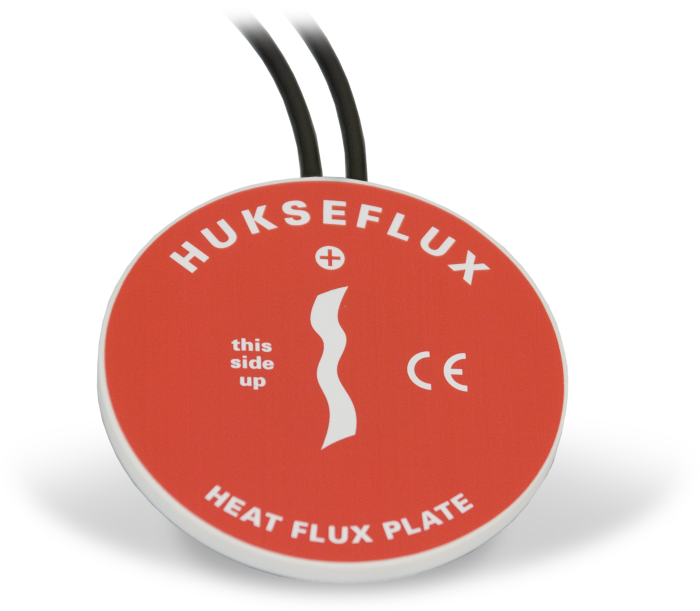 The HFP01SC, manufactured by Hukseflux, measures soil heat flux, typically for energy-balance in flux systems. It is intended for applications requiring the highest possible degree of measurement accuracy. At least two sensors are required for each site to provide spatial averaging. Sites with heterogeneous media may require additional sensors. The HFP01SC consists of a thermopile and a film heater. The thermopile measures temperature gradients across the plate. During the in-situ field calibration, the film heater is used to generate a heat flux through the plate. The amount of power used to generate the calibration heat flux is measured by the datalogger. Each plate is individually calibrated, at the factory, to output flux. Self-calibration corrects for errors due to differences in thermal conductivity between the sensor and surrounding medium, temperature variations, and slight sensor instabilities. Can the HFP01SC-L be embedded in railroad ballast, which comprises a blend of coarse rock particles? No. The HFP01SC-L must be in full contact with the media. Railroad ballast is too coarse. For the HFP01SC-L, is there an available acquisition program that is capable of running in PipeLineMode? The example CRBasic program runs in either SequentialMode or PipeLineMode. To force the CRBasic program to run in PipeLineMode, add the instruction PipeLineMode to the beginning of the program. Can an HFP01SC-L provide correct running averages if the scan rate is reduced to 1 minute? Rather than using a running average to find the millivolt output during a calibration, use a single sample with 50 or 60 Hz integration. See Example 1 in the 2014 or later version of the HFP01SC-L manual. Does the HFP01SC-L have to be in direct thermal contact with the surrounding soil to achieve heat flux readings? What might cause a 25% difference between the factory calibration and the in-situ calibration of an HFP01SC-L? A calibration shift occurs if the HFP01SC-L is not making full contact with the soil during the calibration cycle. The following could cause the plate to lose contact with the soil: a soil freeze/thaw cycle, soil swelling/contracting because of extreme drying/wetting cycles, or rodents burrowing past the plate. What type of quality assurance/quality control can be performed on HFP01SC-L measurements? The in-situ calibration is helpful for quality assurance/quality control. The multiplier determined from the in-situ calibration should be within ±10% of the factory-determined calibration. If it is not, the plate may be damaged, not wired correctly to the data logger, or not making full contact with the soil.